This page provides you with Ux Designer resume samples that you can use for inspiration in writing your own resume, or for creating one through our easy-to-use resume builder. Below you'll find our how-to section that will guide you through each section of a Ux designer resume. There’s no doubting that the UX industry is up the incline, but how will you make yourself stand out from the hundreds of other industry competitors? 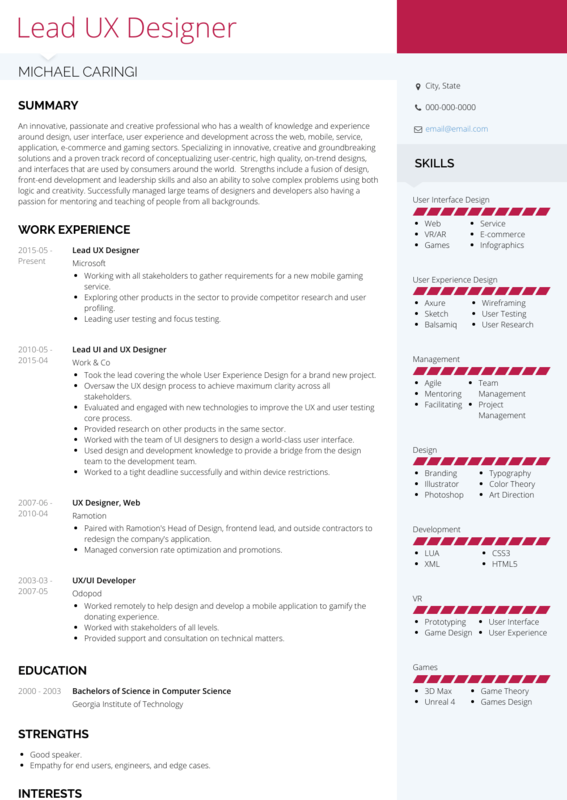 Having a professional UX Designer resume will help you get the attention you deserve. We’ve been helping over 3 million prospective professionals just like yourself with our resume samples. There’s never been a better time to get inspired about your career and start achieving your potential today, with VisualCV. Go for the sleek reverse-chronological format to ensure that all of your biggest industry achievements are outline from the outset. This will give you the best chance to catch the recruiter’s attention, and keep it. Complement your big career wins with a clear font like Arial and Times New Roman and big, bold headings to match. Ensure not to overload it with industry jargon - you want lots of white space and an export in PDF to get the best results when considered by hiring managers. You’ve got around 6 seconds to convince your hiring manager of your hireability - so how do you do that? Use a resume summary that showcases your impenetrable experience and career highlights. Have you got proven expertise in solving core backend issues through rigorous testing and research? Are you averaging some huge customer satisfaction scores or cuts on project completion time? Make this information count! Professional UX Designer with 5 years experience wishes to transition to lead UX role with FutureInc. Current lead position with GoldCore resulted in 20% shorter completion times for prototyping low fidelity concepts, leading to a high customer approval rating (97%). Seeking to leverage this experience and transition into design oversight and mentoring role. UX Designer seeks position with X company. Current lead role at GoldCore involves A/B testing, card sorting and user interviews. Wish to move into a more managerial position. For tips on how to write a UX Designer resume, please consult our resume builder. For junior level UX designer, you can use this section as an objective statement. This will allow you to quantity any transferable experience while also addressing your desire to continue your professional practice. Professional and motivated UX Designer with strong skills in research and prototyping low fidelity concepts seeks UX role at Y Company. Through Axure, Sketch and HTML have improved the back end for local food delivery company, user testing their application, leading to a customer approval rating of 95% on the project. UX Designer with lots of experience in Sketch and Axure seeks job at Y company. Completed a project for a local food delivery company which led to high customer ratings. Not only does you UX designer experience count, it’s essential you make it count in your work history section. Whether you’re hitting 1000+ daily downloads for your latest application debugging or are just about to participate in creating a content development strategy for your first project, we can help this section really light up. Have you deployed innovative custom features at a substantially higher performance than previous UX designers? What about boosting UX scores by 20% more than any other company? Make this experience count! UX Designer with no experience: Undertaking experience in designing a wireframe for a retail company or even making a website for your local bakery is all great experience to include. Transferable skills in using Sketch and or Illustrator is also a bonus. You can check out our detailed resume guide which has lots of information on how to best writing about your work experience. Skills for UX Designers stretch far beyond the classroom, so make this section count with extra industry certificates. A BA in computer science, graphic design or web programming will score you brownie points with recruiters - but certificates like the UX Master Certification program from Nielson Norman, CUA, and Advanced User Experience program will make you even more employable. Technical skills form the bread and butter of what it means to be a professional UX Designer. By tailoring your skillset to the job at hand, you can convince hiring managers that you are the one for the position. Give them an impression of how those functional skills will make you a key asset. Follow our tips here to create a great UX Designer cover letter. It could really help seal the deal! After that career boost? Check out our amazing UX Designer resume templates here (LINK).